Imagine scrambling atop these rock hills to escape danger. Desert bighorn sheep do, in a matter of seconds. Bighorn are well suited to rocky terrain; they have squared hooves with soft skid-proof soles designed to grip. Mountains are their domain. About 250 desert bighorn sheep live here in the park. These are healthy numbers considering the bighorn's sensitivity to human disturbance. 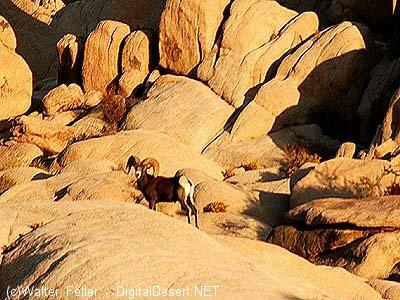 Bighorn require wide, wild territory to roam and water sources without human competition and presence- rare things these days, found only in wilderness areas and protected sites like Joshua Tree National Park. Sheep Pass lies within a historic travel corridor where for centuries sheep have moved between water sources. When water holes dry up, bighorn survive by eating succulent plants like barrel cactus. Since the 1970s, through better wildlife management, sheep-reintroduction efforts, and wilderness land protection, desert bighorn sheep numbers have doubled throughout the desert Southwest. Some local bighorn populations, however, continue to decline. *Note: Mountain lions prefer mule deer to bighorn sheep. Although they will take one occasionally, the risk of failure is greater in the rocky terrain compared to the prefered habitats of the mule deer. Coyotes, are very rarely capable of a successful bighorn hunt. *Note: Bighorn sheep can be quite shy and startled by people. If you are fortunate enough to see one or more of these beautiful creatures, resist the temptation to yell to others, make sudden movements, or approach. Prolong your sighting, give the animal a break.